Docker container is an emerging technology to help developers and devops with easy provisioning and continuous delivery in modern infrastructure. As containers can be ubiquitous in an environment, monitoring is essential. We've developed a monitoring solution which provides deep insights into containers supporting Kubernetes, Docker Swarm, Mesos DC/OS, and Service Fabric container orchestrators on multiple OS platforms. We are excited to announce the general availability for the Container Monitoring management solution on Azure Log Analytics, available in the Azure Marketplace today. "Every community contribution helps DC/OS become a better platform for running modern applications, and the addition of Azure Log Analytics Container Monitoring Solution into DC/OS Universe is a meaningful contribution, indeed," said Ravi Yadav, Technical Partnership Lead at Mesosphere. "DC/OS users are running a lot of Docker containers, and having the option to manage them with a tool like Azure Log Analytics Container Monitoring Solution will result in a richer user experience." Microsoft recently joined the Cloud Native Computing Foundation (CNCF) and we continue to invest in open source projects. Azure Log Analytics is now part of the Cloud Native Computing Foundation (CNCF) Landscape under Monitoring Category. We've added new features to provide better insights to your Kubernetes cluster. With the new features, you can more easily narrow down container issues within a Kubernetes cluster. Now you can use search filters on you own custom pod labels and Kubernetes cluster hierarchies. With container process information, you can quickly see container process status for deeper health analysis. These features are only for Linux—additional Windows features are coming soon. For more information about how to use Container Monitoring solution, as well as the insights you can gather, see Containers solution in Log Analytics. Learn more by reading previous blogs on Azure Log Analytics Container Monitoring. 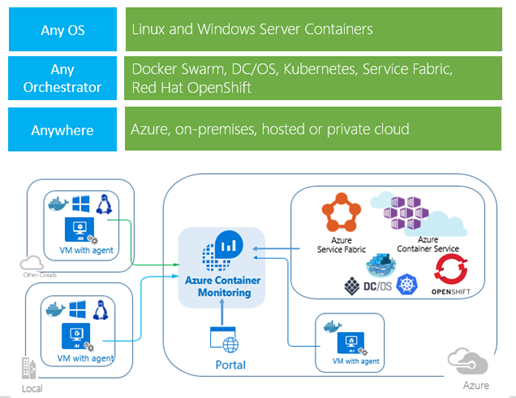 You can get a free subscription for Microsoft Azure so that you can test the Container Monitoring solution features. How can I give you guys feedback? UserVoice: Post ideas for new Azure Log Analytics features to work on. Visit the UserVoice page. Forums: Visit the Azure Log Analytics Forums. Email: Tell us whatever is on your mind by emailing us at OMScontainers@microsoft.com. We plan on enhancing monitoring capabilities for containers. If you have feedback or questions, please feel free to contact us!